Under Grade Options, you can select what grade to display to students, whether to drop any low scores, and set your grading scale. You may choose to display to students only released assessments or all assessments. It is best to select “Released assessments only” during the term so that the system automatically calculates the student’s grade-to-date, including only the assessments that have closed, and which are graded and released. Once assessments are closed, the gradebook will treat non-submissions as 0s.You can assign 0s to students who miss work, but it is not required by the gradebook in order to show an accurate grade-to-date. At the end of the term, choose to show “All assessments” so that the “out of” is the total possible for the course. Etudes will treat non-submissions as zeros, again. You may choose to show the letter grade for the points earned. Click on Edit on the far right of Grade Display to set your preferences. Click on Done to save your settings. 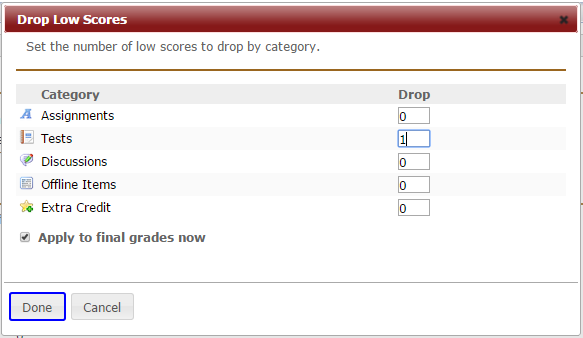 Click on Edit by the Drop Lowest Scores setting and specify how many scores to drop by each category. Check the box to apply these options to the final grades. Instructors and students can easily recognize which low scores have been excluded from the grade calculation by the asterisks around these dropped scores. To set your grading scale, click on the Edit link to the right of its heading. 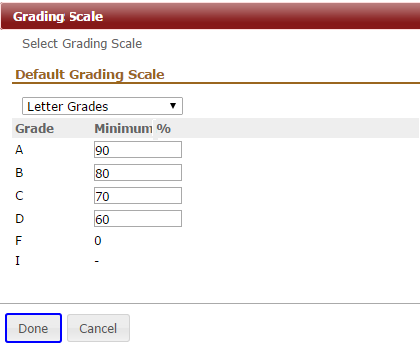 Select one of the default grading scales (Letter Grades, Letter Grades with + / -, or Pass / No Pass), adjust the values as desired, and click on Done.